If you are the parent of more than one child, neurotypical or atypical, this is an episode you are definitely going to want to listen to. I get requests for topics from listeners all the time (which, by the way, is great…please keep them coming! ), and one of the most common requests is for an episode specifically on sibling relationships. So I found the perfect guest to talk about the sibling dynamic—parent educator Julie King. Julie co-authored the book How to Talk So Little Kids Will Listen, a Survival Guide to Life with Children Ages 2-7 alongside Joanna Faber, and leads dynamic lecture/presentations for schools and other parent organizations. 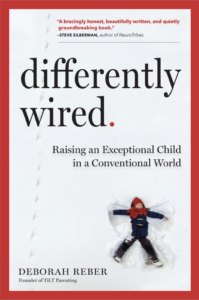 Among the workshops she offers is one based on Siblings Without Rivalry, and she brings to her work the perspective of having raised two differently-wired and one neurotypical kids herself. I’m really excited to share this conversation with you, and I hope to do more episodes on this topic. If you find that there are topics regarding sibling relationships that you want to hear more about, please shoot me an email at debbie@tiltparenting.com. About Julie: Julie King has been educating and supporting parents since 1995. In addition to her work with individual parents and couples, she is a highly regarded parenting workshop leader and public presenter. Her most popular workshops, How To Talk So Kids Will Listen and How To Talk So Little Kids Will Listen, are based on the bestselling books of Adele Faber and Elaine Mazlish and her own book, written with Joanna Faber. She also offers dynamic lecture/presentations for schools and other parent organizations.She has led workshops for numerous schools, non-profits, and self-organized parent groups, and maintains a private practice providing telephone consultations to individual parents and couples. Julie is co-author, together with Joanna Faber, of How To Talk So LITTLE Kids Will Listen: A Survival Guide to Life with Children Ages 2 – 7 (Simon and Schuster). The book has been ranked #1 Best Seller on Amazon for Communication and Social Skills. Hi, Debbie! I’m so proud of you for the wonderful career you’ve created….I’d love to have the book and will purchase it when available. I have a shelf of wonderful books written by friends and acquaintances. I wish you all the best of luck and look forward to seeing you on your book tour! Now, if somebody would tell me the secret of How To Get a Publisher to Consider Your Book! I have a book idea in mind….it’s about people who pre-plan their own funerals and some of the crazy experiences of them and their survivors. A friend who is in that business suggested it and would like to work on it, but we don’t know how to get started. Here’s my major mental/emotional problem: the world of blogs, tweets and podcasts is foreign to me and my brain finds many ways to resist it. Do you know of any resource for treating this kind of problem?